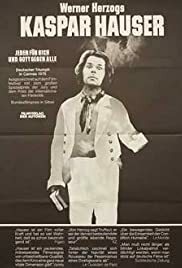 Kaspar Hauser: Mother, I am so far away from everything. Opening credits prologue: One Sunday in 1828 a ragged boy was found abandoned in the town of N. He could hardly walk and spoke but one sentence. Later, he told of being locked in a dark cellar from birth. He had never seen another human being, a tree, a house before. To this day no one knows where he came from - or who set him free. This is the third Werner Herzog film I have watched. The first two were Signs of Life and Aguirre: The Wrath of God. All for themselves and God against All is by far my favorite Herzog movie (and my favorite title). The exploration of Kaspar's primitive mind was fascinating and, at times, even humorous. I enjoyed Kaspar's disdain for the arrogant priests and scientists (but especially the priests!). Like every Werner Herzog movie I've seen thus far, the film does not progress at breakneck speed. This is definitely a turn-off to most movie-goers. I can relate. (Signs of Life had me checking my signs of life). However, I felt that the significant and often humorous dialogue more than made up for the admittedly slow pace.